The image of the modern family is ever changing. They come in every shape and size. From two dads or two moms, families with adopted children, blended families, you name it, they're present. What ties them all together is love. But what is love and who does your love belong to? In David Harms’ audaciously predictable drama What We Wanted, the family at the focus is one of polyamory. Julian and Agnes have invited Sally, and thusly her daughter Reggie, into their home many years ago. Their tight-knit family starts to unravel as the individual hearts long for something different and new. What We Wanted is a play that gets on the theatrical radar for exploring what it means to have a polyamorous romance. To some, it’s taboo. Others, it’s love. Nevertheless, it’s a subject that hasn’t quite found a theatrical platform. David Harms has attempted to do so. Unfortunately, the execution was calamitous. Julian, Agnes, and Sally have a lovey, touchy-feely romance. Living under the same roof for years, their romance begins to unravel as Julian professes his heart has opened to other women, Agnes has a job opportunity in New York City, and Sally has accidentally engaged in flirtmance with her daughter’s boyfriend. When the truth comes to the surface, the happy throuple must decide is their situation working any longer. The way Harms allows his story to unfold is melodramatic with a soapy undertone. The baffling plot is expectable, many twists projected scenes ahead. Harms’ characters are well-educated and express it at every moment possible. Harms introduces a highfalutin language for the characters that detracts from the authenticity of the characters, often teetering on the border of caricature. What We Wanted tried greatly to be an ensemble piece but giving Sally superfluous monologues caused grand confusion. Making Sally a narrator, Harms intentionally, or unintentionally, places her as the centerpiece. 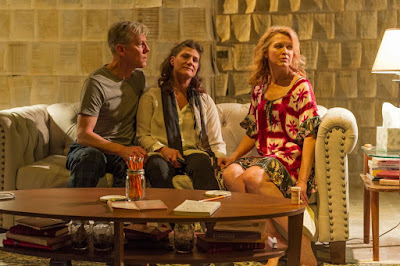 The play explores these characters in the privacy of their own home. We watch the trio through their hippy dippy sentimentality and their new age fluidity but you have to wonder what their professionals act like in public. It cannot be what was portrayed in the comfort of their love nest. No matter what, Amy Bodnar as Sally, Steven Hauck as Julian, and Elizabeth Rich as Agnes did all they could with their characters. Of the three, Rich found a beautiful resolve in Agnes that broke free from the constraints of the world. As the two youngsters, Kerry Warren as Reggie and Brandon Espinoza as Dale showed promise until their story took a drastic turn. Once Dale lusted after Reggie’s mom and Reggie sought revenge, nothing felt realistic. Though if that was the dialogue Harms was going for, he knows how to win over a soap opera crowd. You have to wonder if the hope of distraction from the text was introduced in the form of spectacle. Entering the theater you immediately are struck by Deb O’s scenic design. The walls and the floor are covered in aged papers. It was eerily reminiscent of the design for Eurydice. But it’s a troubling when you can’t decipher whether the break in consistently lined paper that trails off toward the top was a design choice or because there was no more time or paper. The furniture that she choose was a nice marriage of vintage and modern, indicative of the conversation of the relationship in question. Drew Foster’s rules of directions were a bit wonky, especially when it came to the source of music during the dance bits. Being a theatrical device is one thing but it is not earned with the rules previously established. Lighting designers Paul Miller and Joe Beumer had their work cut out for the them with the stark walls but they managed to make it work. What We Wanted is not necessarily daring in normal theatrical standards, as it is a self-explanatory living room drama. What makes it daring is the topic that playwright David Harms explores. What We Wanted is very much a play in progress that shot for the stars and missed in this big production. Harms has a lot of fleshing out to do before the next iteration.